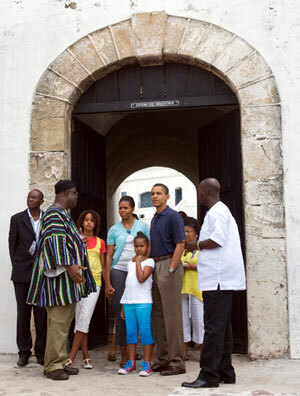 ACCRA, Ghana (FinalCall.com) - The Obama family took a historic visit to an oceanside slave castle in the Cape Coast region of Ghana, where TV cameras captured the family's exploration of the place where the ancestors of First Lady Michelle Obama may have been stolen from. With a guide pointing out the history and the sections of the castle, with its dungeons, cannon turrets and white-washed walls, the Obamas' were able to hear about and pay homage to those ripped from Africa and scattered throughout the Diaspora. “One of the most striking things that I heard was that right above the dungeons in which male captives were kept was a church, and that reminds us that sometimes we can tolerate and stand by great evil even as we think that we are doing good,” said President Obama in brief remarks after the July 11 tour. President Obama told the media the trip was especially important for his daughters, Malia and Sasha, to see and learn lessons from history and heighten “their sense of obligation to fight oppression and cruelty wherever it appears. And any group of people who are degrading another group of people have to be fought with whatever tools we have available to us. Obviously it's a moving experience, a moving moment,” said the president. “It has to teach all of us that we have to do all we can to fight against the kinds of evils that sadly still exist in our world, not only on this continent, but in every corner of the globe. African Americans obviously there is a special sense on the one hand this place was place of profound sadness, on the other hand, it was here where the journey of much of the African American experience began,” he said. To see the portal where the Diaspora began, visit with the people of Ghana and celebrate progress as Blacks and Whites fought to end slavery, and win civil rights for all people “reminds us as bad as history can be, it is also possible to overcome,” said Mr. Obama. He also thanked the people of Ghana for preserving the slave castles and organizers of his trip for the invitation to visit. The president unveiled a plaque to mark his sojourn. The first couple received traditional African names, were presented with honorary doctorate degrees from the University of Cape Coast, and Mr. Obama was offered land to develop. The street in front of the castle was renamed in his honor. A traditional leader “bestowed on the fi rst couple of the U.S.A. the titles, Okukurdofo Kofi Obiekwan and Obatan Efua Nyamekye,” the Daily Graphic reported July 13. “Cape Coast was built by the Swedes and taken over by the British in the 1660s and became their base for enslaving on the coast of Africa for several hundred years, eight miles away at Elmina Castle dungeon started by the Portuguese in 1482. In the 1630s the Dutch and the English allied to try to take the slave system away from the Catholic nations of Spain and Portugal,” he said. The Dutch took control of Elmina in 1637, and these Protestant nations emerged as powers and used their power to control the slave system, Dr. Jeffries explained. The captured Africans were taken across the Atlantic Ocean, “the greatest graveyard in the history of the world,” and into the Western world. “Most of the people who come through don't have time to visit the slave dungeons. They may make a ceremonial presentation at the airport, or even in a square in Accra, Black Star Square. Some may go to Christianbourg Castle dungeon, which was the Danish headquarters, but it's the state house. But it is rare for someone to go out of his way to accept the invitation to go into the slave dungeons. We have to, as African peoples, understand what slavery was, how it lasted from 1482. In Brazil it lasted into the 1880s,” Dr. Jeffries said. Then there is the post slavery impact of colonialism and neo-colonialism, which raped the continent, he said. Reparations have to be discussed, said the respected author and researcher.